Questions related to swimming pool construction, pricing, placement, features and more. 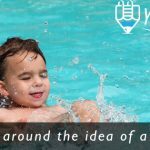 What is the best type of swimming pool? There are 3 types of pool structures available to improve your backyard space, so which one is the best option? We install inground gunite pools – what most would agree is the top shelf of swimming pool structure. The reasons for using gunite to build a swimming pool are numerous but most notable is the unlimited design customization, strength and long lasting qualities. Gunite is concrete applied through a pressurized mixture of 3800 – 4200 psi concrete and water to almost any shape ranging from 6″ to 12″ thickness. Reinforced with an 8″ x 8″ grid of steel rebar, the inground gunite swimming pool is the strongest and longest lasting on the market today. Our gunite pool warranties are lifetime, which is crucial because this is the shell-structure of the entire pool. The starting cost for an average size in-ground swimming pool in Texas starts at about $30,000 and can range from $34,999 to $49,999 and above depending on the size of pool and special requirements or optional features & accessories or upgrades. We have developed affordable starting packages that include an 80 perimeter pool of any shape including energy efficient pool equipment and loads of optional features for very reasonable prices, be sure to check them out. We do NOT offer in-house financing services, we do offer referrals of qualified trusted lenders local and national which may have competitive rates and options available to solve your swimming pool financing & home improvement requirements. First, understand that the construction of a pool is performed in an uncontrolled environment outside and is susceptible to the weather and elements during construction. Weather and elements that could cause some delay during the construction process. Baring any delays from rainy weather, an in-ground gunite swimming pool can be completed in 6 to 10 weeks, and the typical turnaround time could be as little as 5 weeks. Some limitations such as specific material availability, scheduling for specialized applications or the inclusion of a patio or outdoor kitchen may also factor into the time it takes to complete the project. What is the difference of a salt water pool? Chlorine has been around since before the 80’s, and is still used today on a large scale in both private and public swimming pools. Salt Water systems for swimming pools began to gain attention about 20 years ago as an alternative to the harshness of conventional pool chlorine. Using an electronic component, the pool equipment will turn ordinary table salt into scent-less chlorine right in your pool! The advantages to salt water pools are a more soothing and soft water, the absence of chlorine smell, and increased comfort for your eyes. Swim longer and enjoy a more natural feel of water in your pool. You can install a new swimming pool anytime you’re ready! We install swimming pools all year round, even in the winter time. The right time to build is all about your needs, and your time-line. It may be a good time to build in the winter when the weather is not suitable for swimming but the pool will be ready the very next summer season. With the time of installation around 6 to 10 weeks you can install a new pool in the middle of summer and have plenty of time to enjoy it the rest of the year! 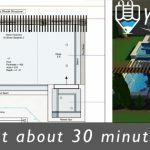 How to choose the right pool builder? Choosing a pool builder is the determination of many factors that will be the overall results of your pool project. Many of our clients begin their research unsure of cost, design details and many more questions. 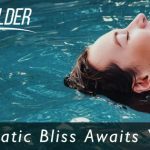 From our experience with hundreds of pool owners the number one goal of a pool builder is to be informative. When comparing bids you must make sure that you have received all the details about the pool so that you can make a true comparison line-per-line. When considering quotations on a new pool it is prudent to exclude any bid that seems preposterously low. We always encourage our clients to receive competing bids, at least 3 on average. Will a pool fit in my small backyard? Got a small backyard and really want that pool but not sure if it will even fit? Some of our favorite projects have been installed in tight spaces throughout the Harris County and Woodlands TX. Some of the new communities are using less backyard space in their plat designs and there is no shortage of aspiring pool owners! We have helped neatly fit small pools and spas into backyards with limited space for many pool owners around Montgomery County. These plunge pools offer the same effects and features of a full sized swimming pool while optimizing limited spaces or restrictions. 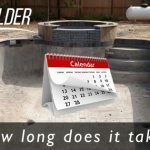 How long does a new pool warranty last? Swimming pool warranties vary between pool builders. Although we can not speak for many other pool contractor’s warranty, we know that our location owners / operators will impress you. Pools installed by operators under the brand typically come standard with lifetime structural, 7 year – 15 year interior surface, 3 – 5 year pool equipment, and 1 year general warranties. Be sure to ask your design rep if any special warranties per their location / department, or territory. Does a new pool add value to my home? Real property improvements such as swimming pools or room additions may increase the value of your home. With as much as 40% of the purchase price of a swimming pool included in a new appraisal of the property you could see this number or even more added to the overall market value of your house. Homes for sale in Montgomery County with swimming pools tend to sell faster, as many buyers choose to purchase homes that already have swimming pools installed. Do I need city permitting? If you plan on installing a new pool and live within the lines of the city limit, yes you will need a city permit before installing the pool. Part of our standard package includes the application, payment, and arrangement for inspections by your local city or township permitting office. Will I need HOA approval to build my pool? If your community has an active POA / HOA then the chances are that you will need application approval before construction of your new pool may begin. This is typical in most of our installations and we handle this part of the process for you. Depending on your neighborhood application guidelines you may have to pay a fee to install the pool, fees vary depending on your HOA requirements. Is there enough access for the excavation equipment? Most cases our normal size equipment will fit into 80% of backyards where we install pools. In communities the space can be limiting, and we have smaller equipment to solve these challenges. Any access less than 5FT access may require a different approach or hand-dig. Do i need to remove any trees before construction begins? If there are any trees within 2ft of the pool layout they may need to be removed if the pool is not modified to fit within the trees. In most cases it is best to keep concrete and the pool structure at least 3′ away from any trees due to the root system. Trees that are close to the pool may cause for more leaves and debris to clean up, and are a consideration when planning the pool close to them. For additional cost we can remove trees for you prior to starting the pool. Will my sprinkler system get damaged when building a new pool? Sprinkler systems and aerobic systems may get damaged when excavating for a new inground swimming pool. In most cases this can not be prevented unless the lines are moved prior to construction. Since it is best practice to install sprinklers when the pool project is complete there is usually no need for re-routing them before the pool is installed. What happens once my new pool is HOA approved? Once the HOA and city permit (if applicable) are approved we are able to begin scheduling phase 1 of the project usually within 1 to 2 weeks! 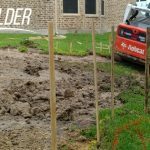 How much dirt is removed from a pool excavation? 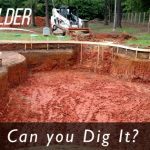 The amount of soil removed from a pool during excavation depends on the surface area and depth of the pool being excavated. Soil that is deemed safe to use will be spread throughout the project for padding and elevations, and in some cases all or portions of spoils are hauled away. Gunite is a form of concrete, with the ability to be applied through high pressure and shaped by hand and holds a curing strength of 3600 to over 4000 psi. Used in combination with 8″ grid steel this material creates the strongest method for creating complex structures like swimming pools in concrete. What if it rains during the construction? The construction of a swimming pool is susceptible to the weather, and rainy days may effect the schedule. 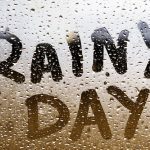 Generally, for normal rain conditions it may delay the project from 1 to 3 days. What are the best materials for gunite swimming pools? The finishing touches of your pool are what make the lasting impression, and there are so many material options to choose from. When selecting the materials start with what suites your style first, and then inquire about the durability and other factors. We offer materials that are highly rated and known for their balance of appeal and longevity. What is a "pool startup"? Once the pool interior is installed it will not be long before it’s time to start-up the pool for finalization. Within a couple of days the pool has been completely filled with water we will begin this process and may last between 1 – 2 weeks. How soon can I swim after the pool is complete? You could swim as soon as one week after completion, although some pool startup procedures may very in time. Instructional information, training videos, tips & tricks for pool owners. After your pool is complete and has been operating for some time (usually up to 3 months) YOU should schedule with a reputable local pool service company to have your pool filter cleaned. It will be a good idea to schedule your next pool filter clean-out within the following 6 months to stay on track and keep your pool water looking clear. Once a swimming pool is completed it will need then maintenance on a regular basis usually once per week. During an instructional that is provided with the installation of your new pool we will go over the required maintenance needs and routine you should follow. You may choose to service the pool yourself or hire a local qualified pool maintenance company. Post construction our team will turn over full responsibility of maintaining your new pool & spa to you. Although we provide a comprehensive instructional course on how to properly operate and care for your pool there may still be questions or advice you may need. Protect your new backyard investment and get professional pool services immediately! We build pools, we are NOT a swimming pool maintenance company! Videos of our products and some tips & tricks for swimming pools. 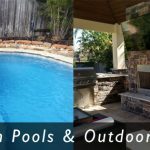 Understanding the various pool interior finishing options available and how it might look in your pool. Here are just a few videos showcasing the endless customization options available for our swimming pools. From safety products to design concerns for swimming pools, check out these videos to make your pool safe! Collection of videos to help you better maintain and care for your new swimming pool. Our line of energy efficient Hayward swimming pool equipment explains why we prefer to use in our pools. See how we take a blank and boring backyard and transform into a wonderful oasis on budget and in 3D!